Cardiff is the primary airport for Wales, it has one runway orientated 12/30 of 2392m in length which is equipped with an ILS. The airport is home to a British Airways Maintenance Centre, and is therefore equipped to handle the biggest aircraft in commercial use with the exception of the A380. IFR Departures should, wherever possible, plan to fly one of the established Standard Instrument Departures (SIDs). Non-standard routings are available but may be subject to some delay depending on ATC capacity. 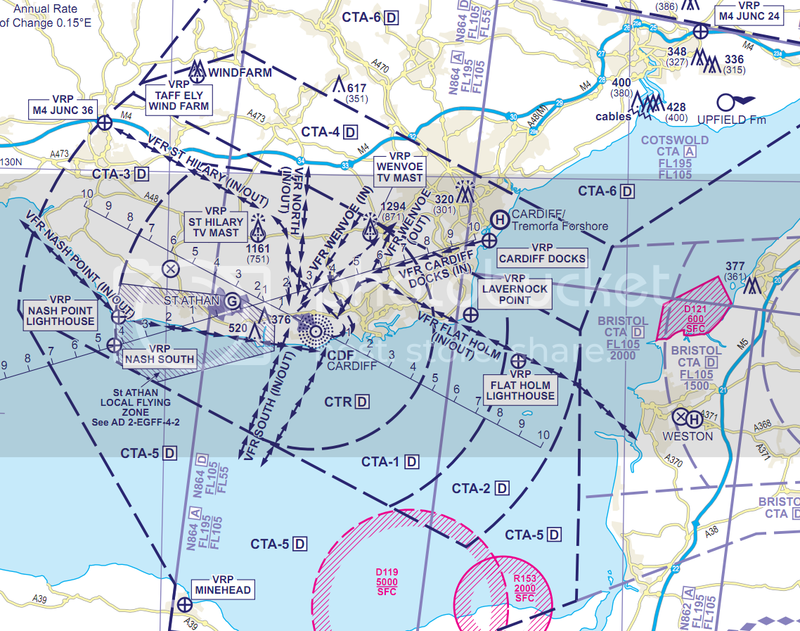 "Cleared to leave the Cardiff control zone via the published VFR ______ route, not above altitude 1500ft QNH ____"
You may be issued a squawk for radar surveillance purposes, the issue of a squawk does not imply that a radar service will be given once outside the zone however. All visual circuits are to the North of the airfield, i.e. right hand turns runway 30, left hand turns runway 12. The circuit operates at a height of 1,200ft QFE. All visual circuits are to the North of the airfield, i.e. right hand turns runway 30, left hand turns runway 12. The circuit operates at a height of 1,200ft QFE. ALVIN1B 12 6000ft Climb straight ahead. At I-CDF D4.5, at or above 2600 (8.2%), turn left onto track 002&deg;, cross BCN D19 above 3500. Intercept CDF NDB(L) QDR 060&deg; to ALVIN above 4500. Cross HON D65.2 at 6000 (see note 6). BCN1B 12 6000ft Climb straight ahead. At I-CDF D4.5, at or above 2600 (8.2%), turn left to intercept BCN VOR R168, cross BCN D18.5 above 3500, cross BCN D14 above 4500, cross BCN D6 at 6000 to BCN VOR. EXMOR1B 12 5000ft Climb straight ahead. At I-CDF D2, at or above 1350 (8.2%), turn right onto track 220&deg; to cross BHD VOR R012 above 3500, intercept BHD VOR R009, to EXMOR. Cross BHD D51.7 at 5000. BCN1A 30 6000ft Climb straight ahead. At I-CWA D4, at or above 2300 (8.0%), turn right to intercept BCN VOR R214, cross BCN D15 above 3500, cross BCN D11 above 4500, cross BCN D6 at 6000 to BCN VOR. EXMOR1A 30 5000ft Climb straight ahead. At I-CWA D4, at or above 2300 (8.0%), turn left onto track 130&deg; to cross BHD VOR R005 above 3500, intercept BHD VOR R009, to EXMOR. Cross BHD D51.7 at 5000. CDF1A Arrival via RETSI (UN862/N862, UN42/N42) continue on 186&deg; to AMRAL then RILES then DOBEM. At DOBEM turn right onto NDB(L) CDF QDM 211&deg; to NDB(L) CDF. CDF1B Arrival via L9 to STU VOR then intercept BCN VOR R288(108&deg;) to BCN VOR via AMMAN, then turn right onto BCN VOR R191 to NDB(L) CDF. CDF1C Arrival via L9 to CPT VOR continue on CPT VOR R266 to NDB(L) BRI via ABDAL then turn right onto NDB(L) BRI QDR 275&deg; to NDB(L) CDF. CDF1E Arrival via N864 (see Note 3), to TALGA continue to BCN VOR on R006(186&deg;) then turn right onto BCN VOR R191 to NDB(L) CDF. CDF3D Arrival via N864, to BHD VOR, intercept VOR BHD R009 to EXMOR via TINAN and TIVER continue on NDB(L) CDF QDM 007&deg; to NDB(L) CDF.